Lucille is the name B.B. King gave to his guitars. They were usually black Gibson guitars similar to the ES-345-355. B. B. King with Lucille. Once outside however, King realized that he had left his guitar inside so he went back into the burning building to retrieve his beloved $30 Gibson guitar. King learned the next day that the two men that started the fire had been fighting over a woman who worked at the hall named Lucille. 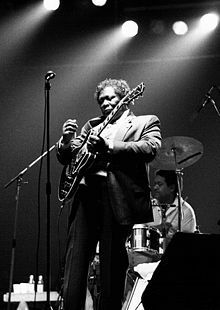 King did not know Lucille but named that guitar, and every guitar he subsequently owned, Lucille, as a reminder never again to do something as stupid as run into a burning building or fight over a woman. B.B. King wrote a song called Lucille in which he talks about his guitar and how it got its name. The song was first released on the album Lucille and is included on the B. B. King Anthology 1962–1998 album. King played guitars made by different manufacturers early in his career. He played a Fender Telecaster on most of his recordings with RPM Records (USA). However, he is best known for playing variants of the Gibson ES-335. In 1980, Gibson Guitar Corporation launched the B. B. King Lucille model. The most noticeable differences between the Lucille and the Gibson ES-355TD-SV on which it is based are the "Lucille" script on the headstock, the maple neck, and the lack of F-holes on the top. King requested that, to reduce feedback, there be no F-holes. Gibson made the B.B. King Standard model from 1980 to 1985. This model had chrome hardware and dot inlays instead of block inlays. The Gibson subsidiary Epiphone markets a low-cost, foreign-made Lucille model based on the Gibson Lucille. Differences include a variation on the headstock inlays, a gloss finish and different pickups. In 1999, Gibson launched the Little Lucille, a version of their Blueshawk guitar. It differed from the Blueshawk in having a Tune-o-matic bridge and a TP-6 stop tailpiece. Gibson discontinued the Little Lucille and the Blueshawk, on which it was based. In 2005, for B.B. King's 80th birthday, Gibson made a special run of 80 Gibson Lucilles, referred to as the 80th Birthday Lucille. They presented the first prototype, which was engraved by Baron Technology, Inc, with design work by Scott Jeffrey, to King as a birthday present. King used the guitar as his main guitar until the summer of 2009, when it was stolen. 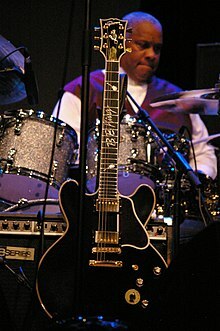 On September 10, 2009, Eric Dahl unknowingly purchased the stolen instrument from a pawn shop in Las Vegas, and was contacted by a Gibson Artist Relations representative, who informed Dahl of the stolen status of the guitar. This Lucille was returned to King in late November 2009. ^ "The Legacy of Lucille: The Surprising Story Behind B.B. King's Guitar". Rollingstone.com. May 15, 2015. Retrieved June 11, 2016. ^ "Epiphone B. B. King Lucille". Gibson.com. ^ "Gibson.com: Gibson Memphis BB King". Gibson.com. ^ "The GIBSON & Baldwin Player – B.B. King – Make the people happy". Player.gibson.com. Retrieved January 4, 2018. ^ "Epiphone BB King Lucille". Gibson.com. June 24, 2008. Retrieved May 16, 2011. ^ Kling, Reno (February 16, 1999). "B.B. King embraces Gibson's 'Little Lucille'". Gibson.com. Archived from the original on May 17, 2008. Retrieved May 16, 2011. ^ Dahl, Eric (December 3, 2009). "One Customer's Pawnshop Treasure". Guitarcenterblog.com. Archived from the original on August 13, 2011. Retrieved May 16, 2011. Eric Dahl, B.B. King's Lucille and the Loves Before Her, Blue Book Publications, 2013, 96 pp, ISBN 978-1-936120-41-3.